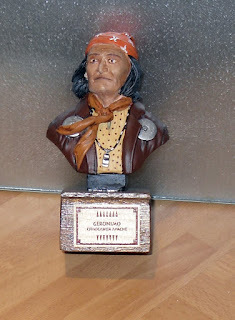 Here is a photo of the Geronimo bust that I finished a couple of weeks ago. Still can't show the secret project. A few more days are needed on that. I have sorted out the next few models. I have put the DAK officer on hold as I am really not sure about the headset. I have a couple of figures and a car kit coming for Christmas but more about them once the day is passed. This means that all I have to get on with for now is the 6-wheel Tyrell and as that was my Xmas present for 2007, I guess I ought to finish it before I start this year's round. That's about it for now. I still have to take another couple of photos of Little Moon and I will do that over the weekend.